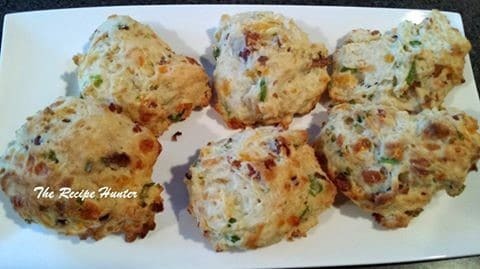 Preheat oven to 380 degrees F.
In a large bowl, mix together flour, baking powder, baking soda and spices to combine, then add green onions, cheese, bacon bits and melted butter and mix. Make a well in the center of mixture and pour in the buttermilk and mix, but stir as little as possible. Drop batter by big spoonfuls onto a parchment-lined baking sheet. Bake in preheated oven for about 20 minutes, until lightly browned.